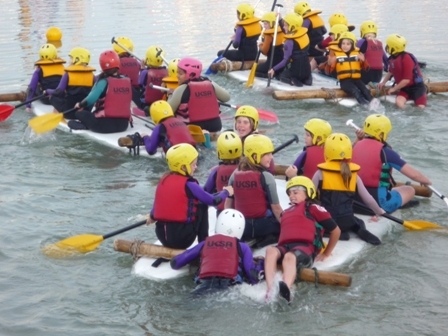 Brownies from units in Brighstone, Carisbrooke, Totland and Yarmouth had an exciting evening of water sports at UKSA during the summer. After designing rafts it was the turn of the girls to see if the rafts would float and if they did then which team would win the raft races. Some unusual designs were drawn up but when it came to the raft building three conventional rafts came down the slipway ready for the races. Instructors from UKSA led the activities with Brownie leaders giving support but the girls really got to grips with sailboards, ropes, wooden poles and paddles and some knots learned at Brownie meetings came in handy. All the Brownies were capable swimmers and teamwork really paid off when the raft races began. There were races with the girls sitting and standing on the rafts and all three designs stood up to the test. Janet Lovell Island Commissioner Girlguiding IW attended together with the leaders from the units.